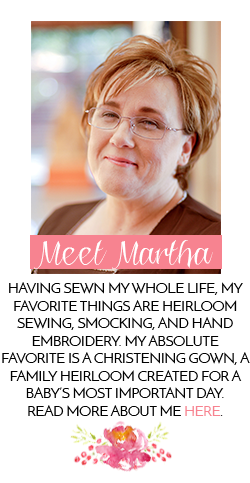 Southern Matriarch: "You get a line, I'll get a pole..."
You get a line, I'll get a pole. Remember that song? 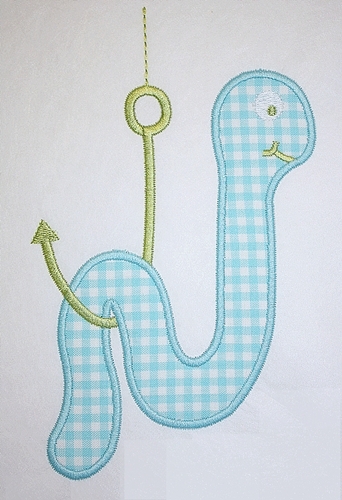 That is what I think of when I see this friendly worm hanging out on his hook. 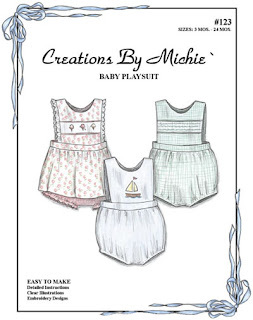 This little romper is a baby gift. Made from red Imperial broadcloth from my stash. 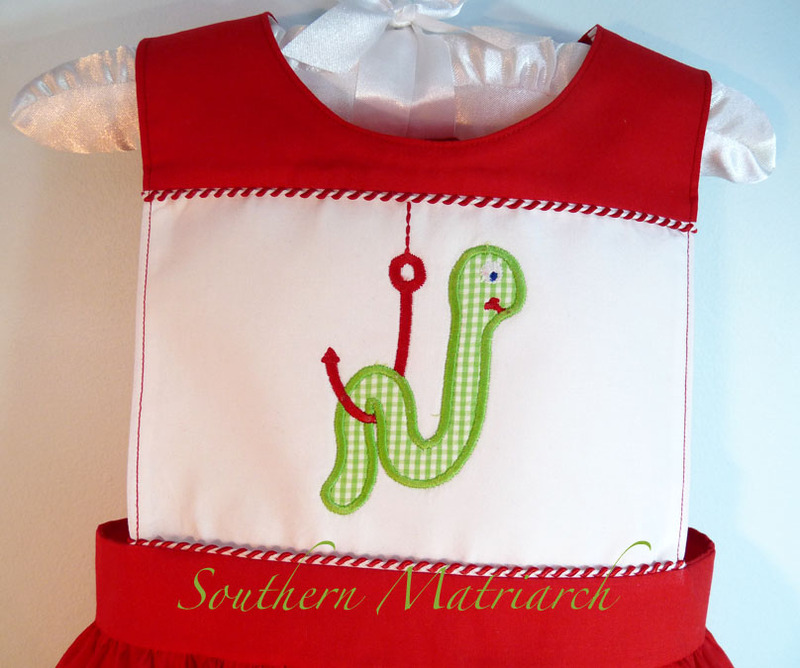 Trimmed with whip stitch piping and a machine applique. 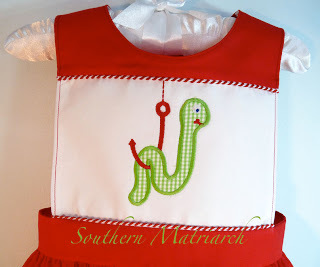 I did line the bib front in white, so that the red wouldn't peek through and look pink. Doesn't he look friendly? 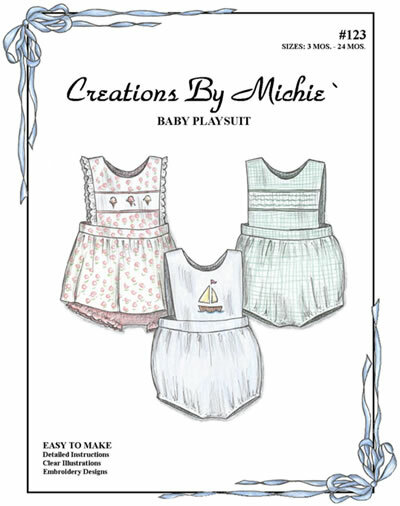 The pattern I used is Creations by Michie' "Baby's Playsuit" It goes together quickly and looks so summery. The applique came from Applique Cafe. It stitches up quick and easy. I like the colors they used as well in their sample. I may make one up in green and aqua next time. 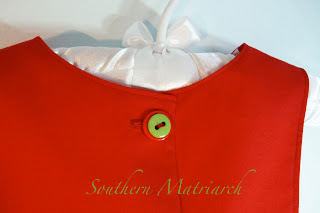 For the back closure I used a Gail Doane trick, I stacked two buttons for a whimsical look. The red buttons are 4 hole craft buttons. The green buttons are from BessieMary. 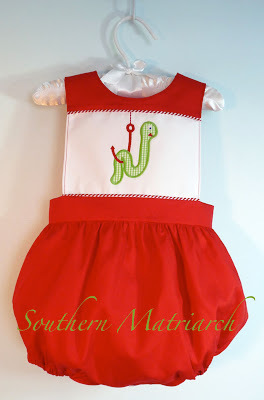 Line up the holes and stitch on with red thread for cute interest on the back. A cute, fun and easy gift for a cute baby boy. For your listening enjoyment. I love bluegrass. Of course this song has to be OLDDDDD, you can no more buy three crawfish for a dime anymore than there's a man in the moon. My part Cajun blooded children would have stuck their fingers down a crawfish hole at nine days old too, if given the chance! Love this gorgeous playsuit! And thanks for the song. Reminds me of going on Crawdad hunts down at the creek during my childhood summers. Good times. :o) Happy Friday! What a happy little worm... guess he doesn't know what's coming next! I love your little outfit. So fresh and cute. Baby will look adorable in it. And thanks for the tip on Applique Cafe. I checked it out and I see several applique designs that I really NEED. LOVE what you did with the outfit! I had forgot about that fun song. I remember my Daddy singing it to me when I was little. That is just about the cutest thing I have seen in a long time!! !